For me, it started with Cadbury’s chocolate powder mixed in boiling water. That was upgraded to using milk instead of water. Then, a few years ago, a friend asked me to go round to watch films with the promise of “the best hot chocolate ever” and made it in a pan with flakes of chocolate. Now, ladies and gentleman, we have the dedicated hot chocolate maker. 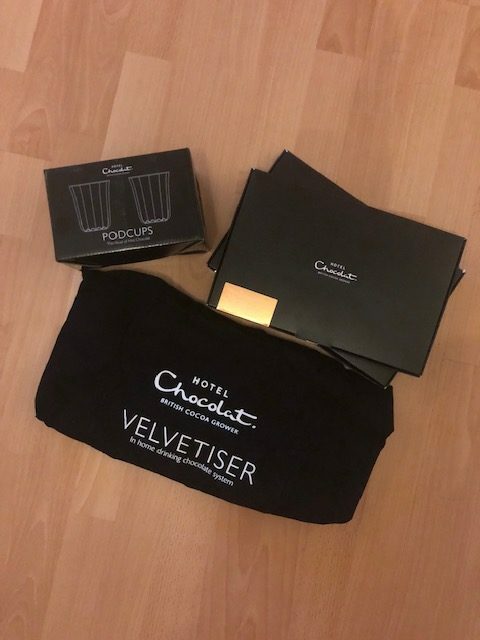 Apparently these are a thing, I just hadn’t realised that before I wandered in to Hotel Chocolat to get a free chocolate just for wandering in to be confronted with a poster of something that looked very cool – the Hotel Chocolat Velvetiser, made by Dualit. 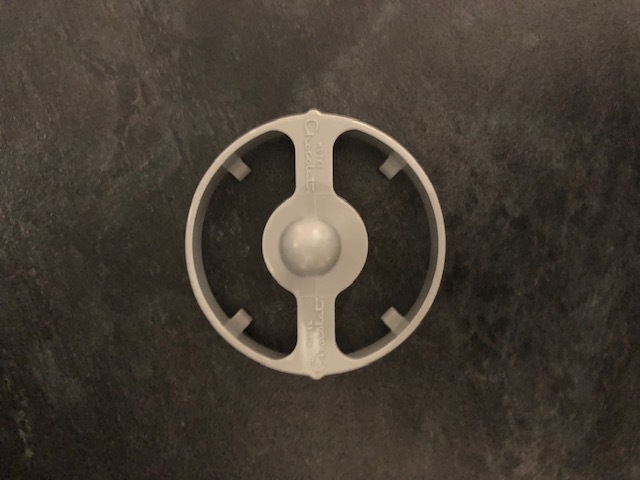 You know that something is supposed to be special when pre-orders for a kitchen product are taken two months in advance and involves a brand new verb. 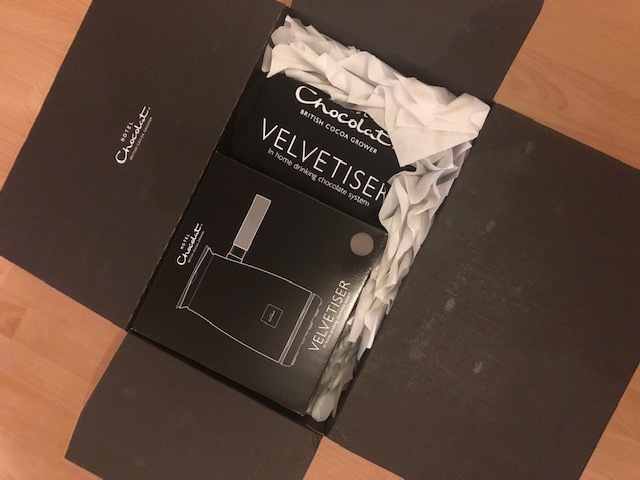 The Velvetiser promises “barista grade” hot chocolate, the likes of which you can get in Hotel Chocolat shops and various other places, like mountain cafes in ski resorts in my experience. Coffee shops will use aerated milk with a syrup and it’s in coffee shops that I understand what Hotel Chocolat mean by “barista grade”. I rate coffee shops based on how well they can make different coffees. 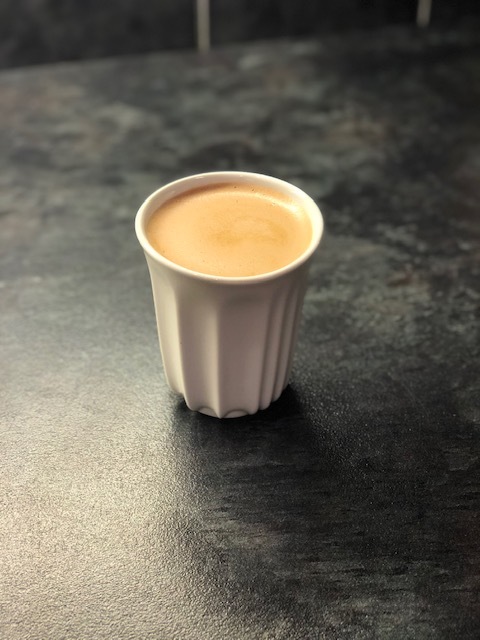 Most baristas can put an espresso shot in hot milk, but many will also just give you a milky coffee whether you order a latte, cappuccino, latte macchiato or even a flat white. A good barista takes the care to make what you ask for, understanding that it’s fine points that make the drink better. But… What can a Velvetiser do to make hot chocolate better? Surely it’s the quality of the ingredients that count more than anything else for this sort of drink. 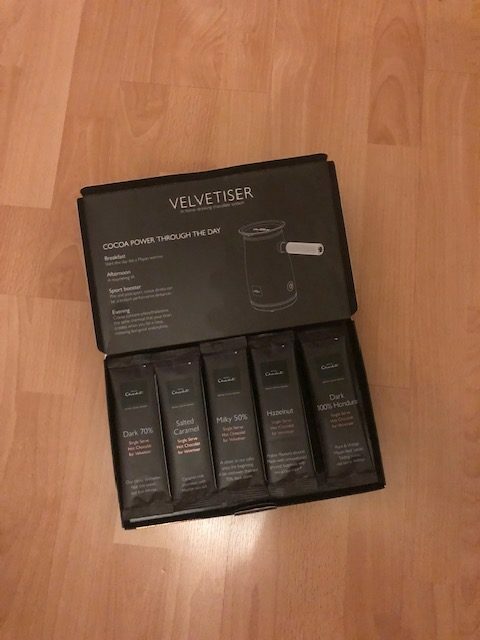 I ordered my Velvetiser because I like the idea of the gadget, more than anything else. At £89.99 I’m not surprised if many will be put it off. That it falls under the £100 price point might act in its favour, but the better deal if you’re prepared to spend this much anyway is probably the gift set at £99.99 that includes an extra selection box of hot chocolate flakes and two mugs (and a bag but, well, I doubt that’s ever going to get used). 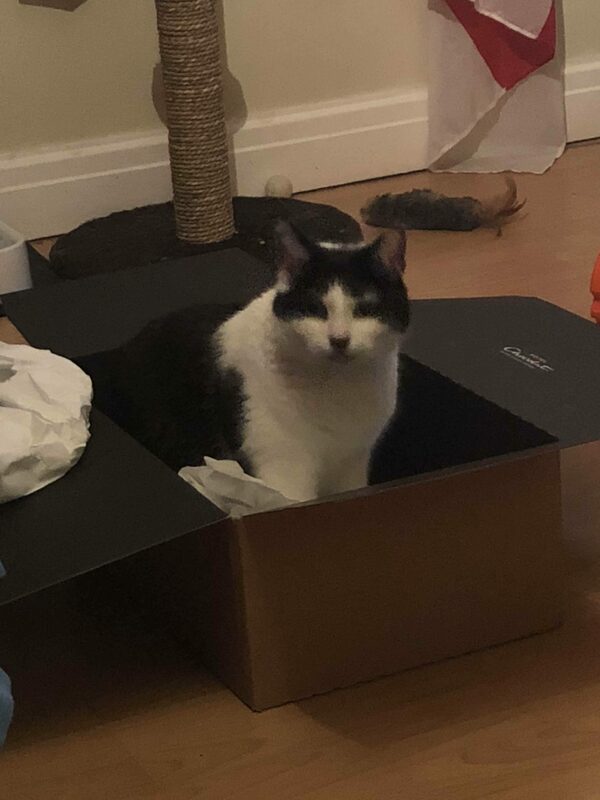 It also comes with a free cat bed, although it’s not marketed as such. I ordered the matt charcoal colour. The copper looks great but wouldn’t go in my kitchen and the white one would maybe have been a little traditional for my taste. 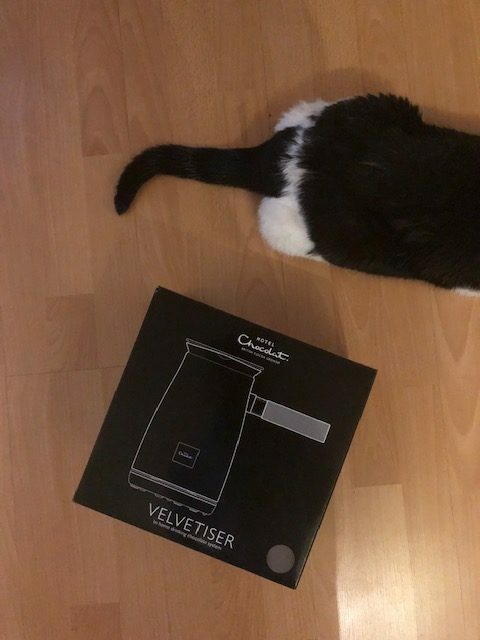 The Velvetiser is basically a kettle with a whisk in it, so it’s not designed to be put in a cupboard. 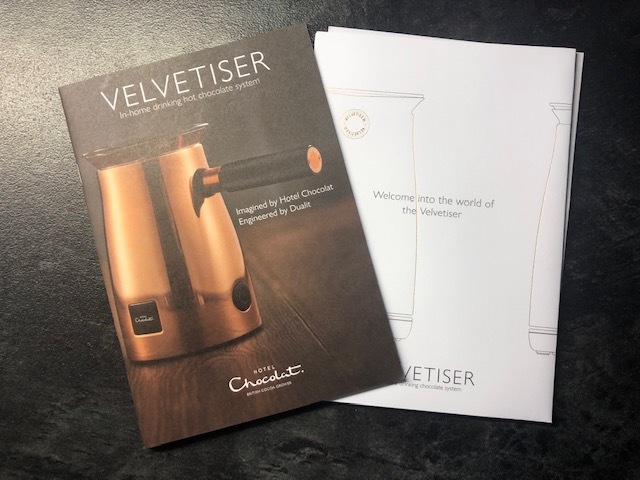 The Velvetiser is designed to sit on your kitchen worktop to give your friends the opportunity to laugh at you for spending so much on it – it will get noticed because it is a very pretty thing. You then get the chance to show it off, and let them eat their words. The Velvetiser feels very well built. The etched handle that makes pouring easy is right and proper. The Velvetiser is weighty, but not so heavy as to be difficult to pour one handed. A selling point is that it can be poured left or right handed. Interestingly (for me), the place where you put the milk is sealed completely. The whisk is driven by a magnet, I would guess, and simply clips in. The only downside of the build that I can see is that my Velvetiser can be wobbled on its base. I expected it to sit more solidly, but it won’t wobble on its own accord and it’s definitely not enough to knock it over, so it’s not really a problem. The instructions, if you care to use them, do miss out the one point I wasn’t sure was important, but you are supposed to put the whisk in first, followed by your choice of milks, and then your choice of chocolate flakes. Because the Velvetiser does not boil the milk, you can use animal or plant derivations. Push the button on the side, which lights up in to a nice white glow, and the whisk starts stirring all your ingredients together. The Velvetiser is extremely quiet. If there is another noise in the room, you won’t hear it. In fact, it’s so quiet that it doesn’t even make a sound when it’s done, which I think I might have liked. The process takes about two and half minutes which means that you want to wander off and do something else in the meantime – talk to the cat or a loved one, put the TV on… Or maybe I’m just easily distracted. A beep might be handy, though. 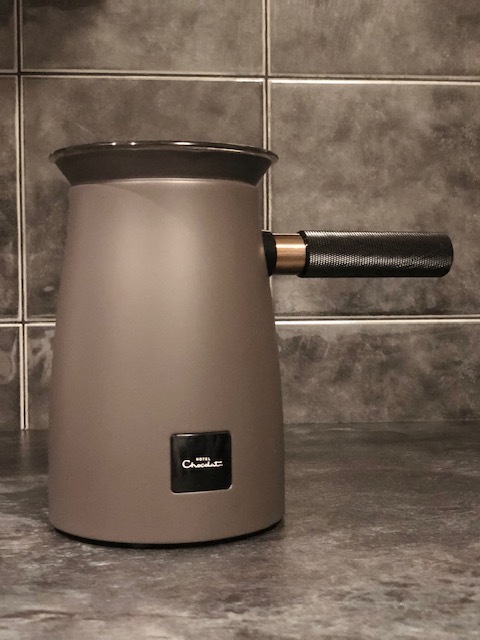 The results are fantastic, and it’s with the results that the Velvetiser tells you everything that you’ve been doing wrong before to make hot chocolate. It has a thermostat that seems to be set at around 55 celsius, meaning that you can enjoy the drink straight away. The correct proportion of milk and chocolate is ensured, although only producing a single serving at a time might be a problem for some. The Velvetiser lives up to its name by producing smooth hot chocolate with rich milk with a frothy top that simply can’t be replicated with a whisk and a pan, and the chocolate is entirely and evenly mixed so there’s no wasted flavour in the bottom of your mug. Cleaning the whisk and non-stick internals is as simple as rinsing under a tap and a wipe with a damp cloth. I have a nagging curiosity about why a company the size of Dualit haven’t put their name to the Velvetiser more obviously. There is no Dualit branding on it anywhere except a small comment on the box to say that they built it. 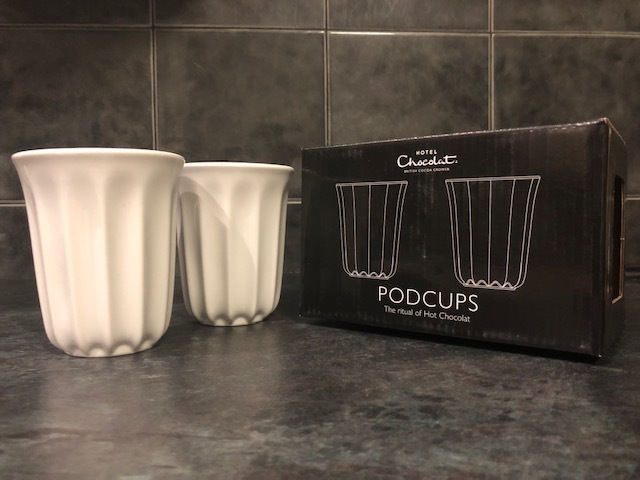 Doing such a thing in collaboration with another brand makes me think that they would see the opportunity to get more of their products in to our kitchens, which makes it a little strange to my cynical mind why they would not take it. The Velvetiser, though, is a great thing. I like to recommend based on a few criteria, usually. If the cost is not a problem, you won’t be disappointed. Likewise, if you really like hot chocolate, you’ll really like the Velvetiser. Just to be clear – it’s brilliant. It’s the cost that has me struggling. If my Velvetiser were to break I’m not sure I’d replace it at the price it’s currently at. It’s fantastic, but it’s not life changing, probably just falling the wrong side of the line in the balance between cost and benefit given the alternatives. It’s not the thick end of ninety quid better than a pan and a whisk when looking at the the upfront lump sum cost of getting each. That sort of money needs thinking about. That won’t be a surprise to most, because the Velvetiser is very much a luxury item and its value for money will probably be determined by how long it lasts before breaking. The Velvetiser has a 1 year guarantee. Assuming it makes 1.5 cups per day, I don’t really have an issue with the 17p a cup premium – it is worth that. 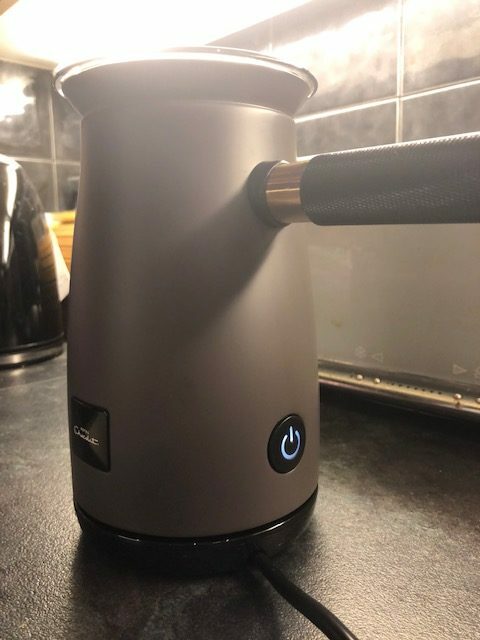 Just as a good barista will make you the coffee you actually ask for, the Velvetiser will make hot chocolate the way it should be made and for both you know you have to pay a little extra to get that extra quality. Hot chocolate, for me, is comfort on a cold night in front of the fire. The Velvetiser makes your hot chocolate the way you want it made, and that’s not powder and boiling water. It’s the way that makes you want to ring your friend so that you can spend time with them and have the best hot chocolate ever.